This One-Step Handwashing And Sanitizing Soap Is Specially Formulated For The Food-Processing Industry. E-2 Sanitizing Lotion Soap Eliminates The Need For A Chlorine Dip. Fragrance-Free Formula Is Effective Against Common Spoilage And Foodborne Illness Organisms. It Meets The Nsf Chlorine Equivalency Standard For Sanitizer Status And Is Listed With The Nsf As An E2 For Use In Usda-Regulated Food-Processing Environments. Part Of The Gojo Hygiene Management System For Food Processors, The Certified Kosher Refill Is Designed For Use In Gojo 800 Series Bag-In-Box Dispensers.. This One-Step Handwashing And Sanitizing Soap Is Specially Formulated For The Food-Processing Industry. E-2 Sanitizing Lotion Soap Eliminates The Need For A Chlorine Dip. Fragrance-Free Formula Is Effective Against Common Spoilage And Foodborne Illness Organisms. It Meets The Nsf Chlorine Equivalency Standard For Sanitizer Status And Is Listed With The Nsf As An E2 For Use In Usda-Regulated Food-Processing Environments. 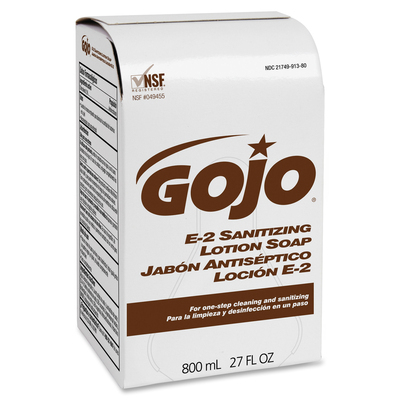 Part Of The Gojo Hygiene Management System For Food Processors, The Certified Kosher Refill Is Designed For Use In Gojo 800 Series Bag-In-Box Dispensers.